Last week, I decided to create a painting for the Illustration Friday's theme of the week, "Resolution". 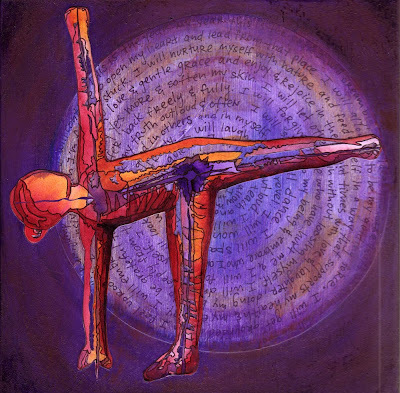 One of my resolutions for the new year was to make art and do yoga everyday. So I created a piece to reflect that and today, I'm going to share with you the anatomy of the painting! I began the process by moving into the yoga pose that I wanted to draw. It is called ardha chandrasana, or half-moon pose. I engaged my feet and drew everything into the center of the pose, the core of the pelvis. Then from that place, I expanded back out, stretching and reaching outward from the core. This standing pose helps to build stability and strength from which you can then shine back out that much more courageously. It helped me to practice the qualities I wanted to bring into my new year. Next, I got out my sketchbook and pictures of the pose and did some drawings of the pose. From there, I pulled out my paints and painted the figure, focusing on colors that I felt represent the qualities this pose invokes. Once the painting dried, I began to draw in the movement and flow associated with the pose. Next, I cut out space in the figure. Then, I got out a pen and paper and began to write, free-flow, engaging with the art through words. These words then became the background for my painting. For this painting, I re-wrote the words into a circular shape and placed them on top of a wooden panel I'd painted a deep purple color. I then painted over the words and added my cut-out figure to the painting. And then I had a finished painting, which I named "Resolve"! What a wonderful view into your process Eliza! Thank you for sharing this with us.